NAFEMS asks that you participate in their survey on use of HPC in engineering simulation. The survey’s results will be revealed at the 2015 NAFEMS World Congress. Jetstream will be a new NSF cloud computing resource with the aid of a $6.6 million grant. NSF also spent over $9 million on a new supercomputer called Bridges. Mentor Graphics released the latest version of FloEFD with improvements in meshing, visualization, and physical modeling. Aerosoft released GASP 5.2 including mesh adaption and other features. MSC Software released the 2014 versions of Nastran and Patran. A team led by NASA Langley engineers received an HPC Innovation Excellence Award for their use of CFD to study aeroacoustics. Image from NASA. Click image for article. All the superlatives we in the CAE software business use basically mean “better than we did before.” I stole this idea from Fred Brooks’ classic book on software development The Mythical Man-Month in which he wrote that the desire for automation really just means to make things work better than they work today. However, we and many other folks in the industry do try to quantify our superlatives by documenting accuracy and speed. Affordability is a red-herring. What matters is value; what benefits do you accrue for the amount you pay? A software program unto itself does not a product make. A product consists of the program plus all the other stuff that makes it actually useful, from installation, maintenance, upgrades, documentation, support, etc. Speaking of “ease of use,” Symscape delves into the issue of GUIs for CFD software. Based on a few reader questions let me clarify what’s going on with the recently announced 1st Analysis, Simulation, and Systems Engineering Software Summit (ASSESS) coming up in early January. Attendance is by invitation only and all invitations have been sent and accepted. The rest of us can’t get in. [Channeling my inner Maverick, “Negative, Ghost Rider, the pattern is full.”] You can see the list of attendees on the conference website and it’s a “who’s who” of CAE. The rest of us will have to wait for the post-event press conference on 13 January and fortunately I’m on the list for that. I really look forward to learning more about this and again applaud the organizers, Cyon Research and intrinSIM. Beta CAE announced the 6th Beta CAE International Conference to be held 10-12 June 2015 in Thessaloniki, Greece. The call for papers is open with a due date of 27 February. The 15th FLOW-3D European Users Conference will be held on 02-03 June 2015 in Nice, France. Abstracts are due by 17 April. Kitware has shared a video of their SC14 experience. 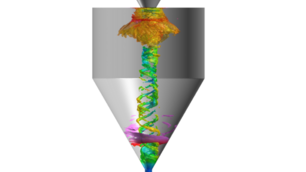 Spray dryer simulation. Image from Dairy Reporter.com. Simulating spray dryers with CFD. If you haven’t yet had your fill of Disney’s Frozen, watch this brief video detailing the science of animating snow. [To prove that I’m not biased against automotive CFD] here’s a brief article about Nissan’s V8 supercars that mentions CFD. Next time you’re staring forlornly into the bottom of your empty whisky glass, consider the fluid mechanics that contributes to scotch whisky ring formation. Not a scotch drinker? OK, maybe you’re interested in why your beer is less likely to slosh and spill. SimScale seeks to hire a CAE Sales Engineer in Munich. Tecplot wishes to hire a Strategic Account Manager. Speaking of Tecplot, they ask the rhetorical question Why One Trillion Cells? With the holiday gift-giving season upon us, what better gift is there for the mesh generator on your list than this luxurious, cashmere, tetrahedral blanket. Imagine being swaddled in this surface mesh while viewing your most recent CFD solution. It is said to be inspired by origami but I know a mesh when I see one. The Bloom Blanket sells for $300. The tet-inspired cashmere Bloom Blanket. Image from bloomblanket.com. See link above. This entry was posted in Applications, Events, Hardware, News, Software and tagged Aerosoft, Beta CAE, CAD, Cyon Research, FloEFD, FLOW-3D, GASP, intrinSIM, jobs, Mentor Graphics, MSC, NAFEMS, Nastran, Patran, SimScale, Symscape. Bookmark the permalink. Thanks for the video, Wolfgang. As with all things cloud, there are many interpretations of “porting to the cloud.” A true native port (e.g. HTML5, WebGL) is non-trivial. And in our two attempts with different vendors, simply streaming the app from the cloud to the desktop doesn’t work all that well, so much so that it’s not worth making customers suffer through it. For example, some of these codes are already packaged for the cloud and offered here: http://goo.gl/CzuKwa, and a compendium of engineering cloud case studies is here: http://goo.gl/rtEW4X .